Amishi Jha on the TED stage. Part 3 of the TED Radio Hour episode Attention Please. Amishi Jha is a neuroscientist whose research focuses on attention, working memory and mindfulness. She is an associate professor in the Department of Psychology at the University of Miami, and the director of Contemplative Neuroscience for the UMindfulness Initiative. Jha received her BS in Psychology from the University of Michigan, and her PhD in Psychology from the University of California-Davis. On the show today, ideas about how the things that compete for our attention might actually be hurting it. AMISHI JHA: This is this whole myth of multitasking, like, I'll keep all of my alerts on and sit down to do something important. It never works out. RAZ: This is neuroscientist Amishi Jha. She's a professor at the University of Miami, where she studies attention. JHA: Deciding to pick up your phone to see who just texted you, or looking at that website just because you wanted to see if you want to buy those new pair of shoes, whatever it is, it's pulling your attention away and now you have to expend even more capacity to get it back on track. RAZ: Can you break this down from a neuroscience perspective? Like, what actually is attention? JHA: One way we can think about attention, I see it as sort of like a flashlight. So just like a flashlight, you know, wherever we direct it in a darkened room, that part of our visual scene will be processed better. It allows us to willfully direct our brains' resources to particular things, whether it's the external environment, or we can even direct that flashlight internally to memories or emotions, if we'd like. RAZ: For the past 15 years, Amishi's been studying why it's harder to pay attention the longer we have to do it. JHA: And what is making people more likely to decline in their performance the longer they have to stay attentive? RAZ: And a lot of her experiments start with participants putting on these hats that kind of look like swimming caps. And those caps have electrodes embedded in them to measure attention. JHA: With things like functional MRI and brainwave recordings. RAZ: And then participants are asked to do a series of tasks. JHA: Something as simple as, you're going to see a number on the screen. Every time you see a number, press a button. Except, when that number's three, don't press the button. RAZ: Sounds pretty easy, right? JHA: Right. It's so simple. RAZ: You see the number three. You don't press the button. JHA: But what happens within - I would say within two minutes of having people do this task, they mess up. JHA: Sure enough, they press the button. And you wonder, why? I mean, you didn't make the numbers hard to see. No. But what we did is make the task so boring that people willfully will start mind-wandering. 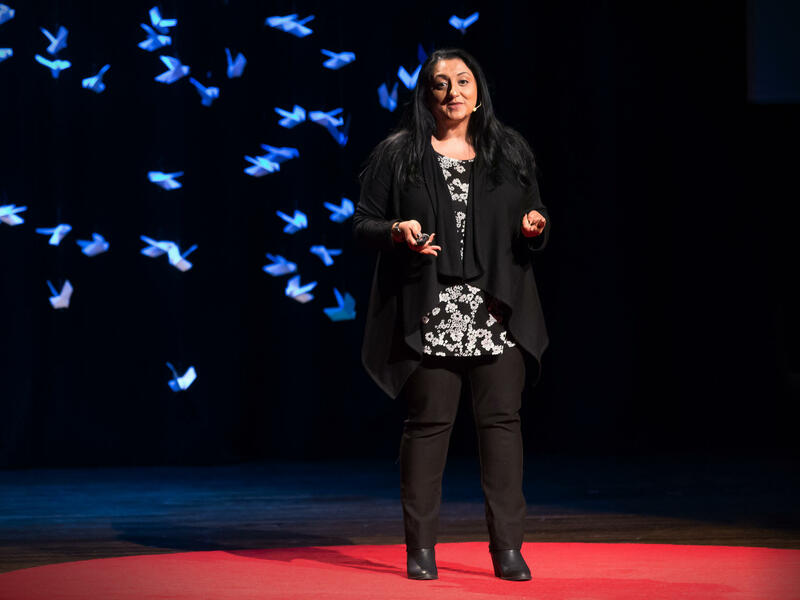 RAZ: Amishi Jha picks up her idea from the TED stage. JHA: So what do all of these studies tell us? They tell us that attention is very powerful in terms of affecting our perception, and things like stress and mind wandering diminish its power. But that's all in the context of these very controlled laboratory settings. What about in the real world? What about in our actual day-to-day life? What about now? Where is your attention right now? I'd like to make a prediction about your attention for the remainder of my talk. You will be unaware of what I'm saying four out of the next eight minutes. Now, why am I saying this? A growing body of literature suggests that we mind-wander. We take our mind away from the task at hand about 50 percent of our waking moments. And when this mind-wandering happens, it can be problematic. Now, I don't think there'll be any dire consequences with you all sitting here today, but imagine a military leader missing four minutes of a military briefing, or a judge missing four minutes of testimony. The consequences in those cases could be dire. So one question we might ask is, why do we do this? Why do we mind-wander so much? Well, part of the answer is that our mind is an exquisite, time-traveling master. We can rewind the mind to the past to reflect on events that have already happened. Right? Or we can go in fast-future to plan for the next thing that we want to do. And we land in this mental time-travel mode of the past or the future very frequently, most times without our awareness, even if we want to be paying attention. RAZ: I feel like we humans are in this grand experiment where increasingly we're all becoming like cats in front of a laser beam. RAZ: Like, we're just like squirrels in a park. You know, it's, like, every direction. We're just, like, looking around. RAZ: And so that means we're not attentive. We're not focusing on a task or a person or a conversation or something. But then there's this whole group of people, like, you know, like, Manoush Zomorodi, who we heard from earlier, who say, well, you need to let your mind wander, right, because that's where creativity comes from. And I don't quite know how to reconcile those two different ideas. JHA: Yeah. Both are true. Both are tied to spontaneous thought. But when I use the term mind-wandering, I'm really referring to that happening when we don't want it to. We want to be focused on something, and another thought pops in. The other category would be something we more colloquially would call daydreaming. That's when you let this happen without cost. JHA: That capacity to let the mind engage in spontaneous thought is so generative. Positive mood increases. Creativity increases. And the key is that we have the space to do that. So if every moment the attention system is being occupied by some other demand, there are fewer opportunities to let that spontaneous thought arise. And I think that's why we need to set ourselves up to have daily practices that help give us that space back. JHA: And you see this already. I mean, to have people actually sign up to go into a room and sit quietly with their eyes closed on purpose. RAZ: Like one of those meditation retreats. JHA: Yeah. But that wouldn't have happened before we were constantly bombarded with information. But people do this all the time. JHA: You know, I did it. You know, I decided to take a week trip to India, not have my phone, and sit with my eyes closed and not talk to anybody. RAZ: I mean, did you go there just as a researcher to think, you know, I'm a neuroscientist, and I study this stuff. I should go check it out? Or did you - were you like, I am losing my mind. I need to, like, get control over it. JHA: Well, the whole reason mindfulness training entered my laboratory is because of my direct personal interest in it. And the interest came grudgingly. I mean, I'm an Indian woman. I grew up in a family where my parents meditated probably since I was a child. JHA: And growing up, I pretty much disregarded it. It's like, it's that thing they do. RAZ: You were like, it's that weird thing my parents do. JHA: Exactly. I'm a Western scientist. Like, unless there's evidence, I don't care about it or I don't trust it. JHA: And I was probably in my late 30s and realized that being in a highly demanding academic profession, having young children, a husband who was in grad school, it was really hard to manage my own stress. And that's what made me interested in engaging in some tools that I could implement daily to help my attention. Here I was studying it in a lab, but I felt like I had no access to it. RAZ: So what was it like? JHA: (Laughter). It was terrifying at first. It was kind of like a boot camp for attention. JHA: And it was kind of funny because after I was done with the retreat, you know, I had to go back to the airport, return to regular life. And I'm like, I wonder if all this time did anything? And one of the first things that happened to me, I was in the aisle seat. And a woman came up to me, and she's like, I'm in the middle seat. So I got up to let her in. As she was sitting down, she poured the entire contents of a jumbo size beverage on me. (Laughter). And my response was just - surprised me. I was just like, that's OK. You didn't mean to do that. It's going to be all right. JHA: And that was the test. Just, like, I didn't get angry. RAZ: You didn't freak out. JHA: I didn't freak out. It was such a sense of balance I had, even as I was experiencing something potentially unpleasant. RAZ: How long did that last? JHA: (Laughter). You know, it's funny because my children comment on that. They're like, we think the retreat effect is gone now. JHA: Yeah. Go back. I guess, subjectively, it really depends on how my commitment to continuing to practice remains intact as I return to normal life. RAZ: So, I mean, it's interesting because this has been - like, the idea of mindfulness and meditation, this has just exploded, especially in your field, in neuroscience, over the past 10 years. Like, 20 years ago, when you were - probably when you were doing your Ph.D., this was still kind of, like, fringe stuff, right? JHA: ...This is career suicide. RAZ: You're never going to get tenure. JHA: Never going to get tenure, and nobody will ever care. So stop. And, frankly, my curiosity got the better of me, and I said, I can't not do it because I'm finding that it is an incredibly powerful tool that not only have I benefited from personally but we've seen over millennia that people have gone to this type of mental training to help themselves feel better. RAZ: So Amishi, if we're now, you know, really beginning to understand this link, this scientific link between meditation, mindfulness, and attention and focus, what is actually happening in our brain when we practice mindfulness? JHA: Right. That's what we're exploring right now. So just to begin by demystifying the whole thing. I mean, the work in my laboratories is taking a cognitive neuroscience brain-training approach to asking and answering that question. We look at brain networks that we know are responsible for things like focus. Salience detection, mind-wandering. And the evidence is now amassing that it's those same brain networks that are getting stronger. So we see that as the mental push up - focus, notice, reengage. And this is not some kind of spa vacation. We're not trying to mollify people. We're trying to wake them up to what's actually happening in the moment and in their lives. RAZ: Neuroscientist Amishi Jha. She's an associate professor at the University of Miami. You can see her entire talk at ted.com. Transcript provided by NPR, Copyright NPR.